Babies develop different skills at different times, but for the most part they can not yet walk or talk and many are still developing both their senses of sight and hearing. In this way babies are truly defenceless creatures, but because they have little experience or independent interaction with the world they are always primed to learn more. While interaction between babies will always remain something of a mystery to observing adults, knowing how babies interact with their surroundings should uncover a bit about these connections. A baby interacts with his/her world in a variety of ways and by using most of his/her senses. Babies will cry, shriek, wail, gurgle and squeal to communicate needs or emotions with others, and will often copy sounds or actions that others make towards them. Babies will mimic others’ facial expressions (smiles, frowns, etc.) or hand movements (such as waving or pointing) and often reach for brightly coloured or clearly defined objects that catch their eyes. 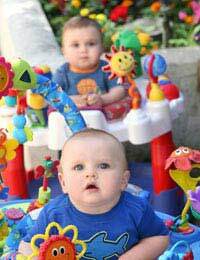 Grabbing, throwing and tasting objects are also methods by which babies explore their surroundings. When babies are put together there may be some interaction, though often, babies are more distracted by objects or toys and will devote their attention to these instead. This is common, so parents should not be upset or embarrassed if their child “ignores” another baby for a little while. When they do interact with each other, most babies are unaware that other infants are quite similar to themselves so they will again use their senses to explore these new creatures. Hitting, poking, smelling and tasting are all quite common between babies. When they have ascertained that other babies are not harmful – and may even be fun – babies will often mimic another’s noises and unfortunately begin to cry or scream when another does. This may be for many reasons, including that the baby is disturbed by the noise, is seeking a similar amount of attention or is simply bored and finds it interesting for a few minutes. While babies explore their worlds and interact with each other, parents should care to keep them safe. Babies should never be left alone with items that they could swallow or stick up their nose, nor should they be left near sharp objects or edges, at a height from which they could tip or fall, or close to open flames or open water. Clearing the area in which a baby will play is also a good idea. When babies are together, they should never be kept in a crib, cot or play area that is too small to accommodate both. Babies should also never be forced to stay with another or in an area that is clearly making them uncomfortable or agitated. It’s not fair on the baby, but it’s not fair on the adults who will have to deal with their displeasure either. All babies will interact differently with their surroundings and their peers, but most interactions between babies are benign. Babies are still only just learning about the world around them, so their actions should not be assigned the same meanings as an adult’s actions would. Instead, babies should be encouraged to play nicely and make friends, but not censured if they don’t.